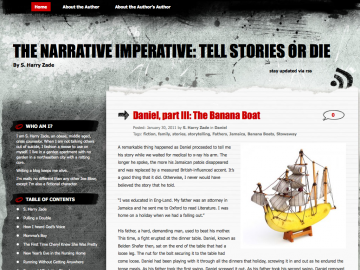 The Narrative Imperative: Tell Stories or Die, is written by a character of my creation, S. Harry Zade. Harry is an obese, middle aged, crisis counselor, who, when he is not talking others out of suicide, is fashioning a noose to use on himself. He lives in a garden apartment with no garden in a northeastern city with a rotting core. Writing a blog keeps him alive. The Narrative Imperative has not been tagged yet. Help others find The Narrative Imperative by tagging it! The Narrative Imperative has not been recommended yet.